Dial has been a huge brand in the skin care industry since the 1940s (65 years!). Growing up, we used Dial bar soap in our home. I always thought it smelled great, cleaned well, and left my skin hydrated. Dial has evolved over the years by coming out with different products, but their core values are the same. Their motto is, "Healthier Skin. Healthier You". 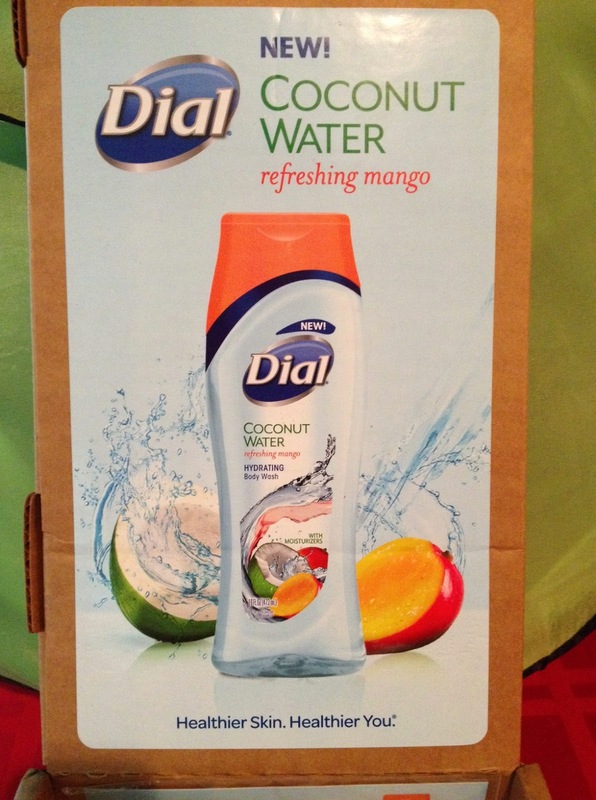 Dial has created a line of products that contain Coconut Water. 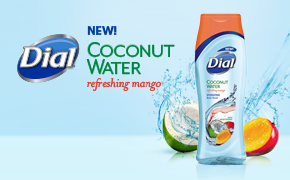 Their newest addition to the Dial Coconut Water family is Dial Coconut Water Refreshing Mango body wash. I was sent a full size body wash to review. I was so excited to rip open the box and see what was inside when I found the package on my doorstep. This has nothing to do with the actual product, but I loved the way the packaging displayed the body wash and held the other contents. I was not disappointed by the product either. There are three main factors I look for when choosing a body wash. What it smells like, if it lathers well, and how well it cleans. This body wash rates high in all three categories. The tropical mango scent is clean and refreshing, without being overpowering. I found that the body wash had a rich lather when applied to my pouf bath sponge or loofah. Not much was needed to create a lot of suds. Finally, I felt that this hydrating body wash cleaned well and left my body feeling moisturized and nourished. 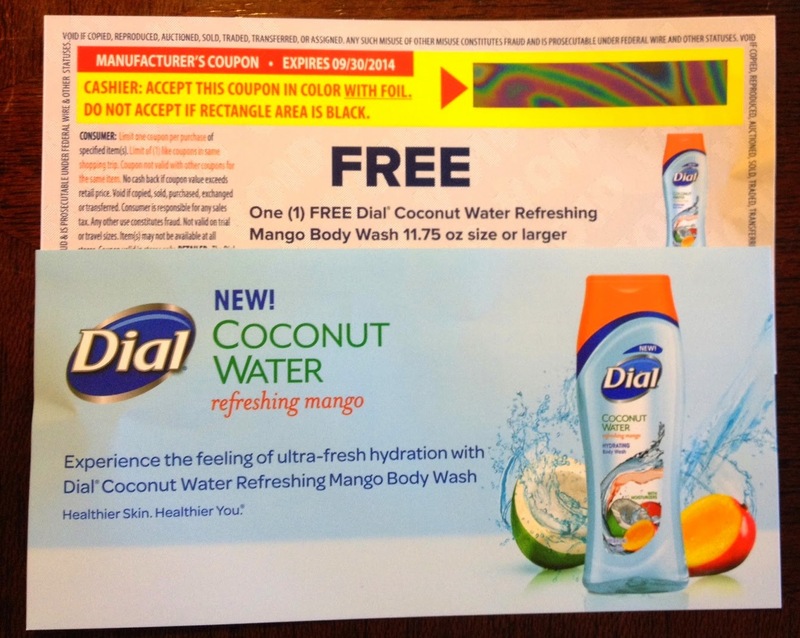 The best part is that I was sent free coupons, so three lucky readers can try out the Dial Coconut Water Refreshing Mango body wash too! All you have to do is enter below using the Rafflecopter widget! 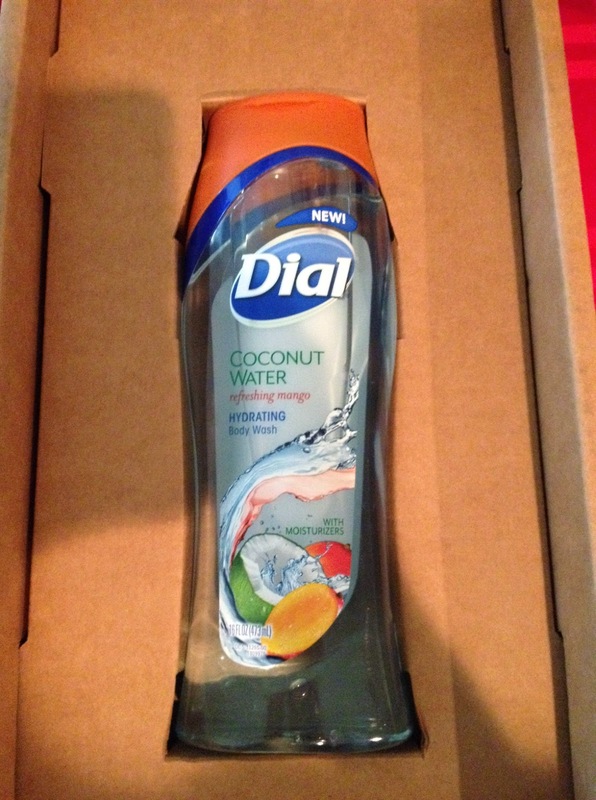 "The Dial brand provided me with a sample of Dial Coconut Water Refreshing Mango body wash in exchange for a product review. However, all the opinions expressed here are my own." #GetNoticed I'm always looking for new products to try. #GetNoticed I use Dial products daily and I am eager to #GetNoticed by using this new scent. #GetNoticed I want to try the new Dial body wash because I love mango! #GetNoticed. I love to try new products! #GetNoticed I love Dial products - all of them! #GetNoticed I would love to try this because the combination of coconut water and mango sounds enticing! #GetNoticed I would like to try this scent because it sounds refreshing! #GetNoticed I would love to try this scent because I love coconuts and mango. #GetNoticed i bet i would like the new scent and i would like to try it! #GetNoticed I want to try this body wash because Dial is amazing already so this product has to be fabulous! #GetNoticed because I love dial hand soap but I've never tried their body wash.
#GetNoticed I love Dial and I want to try it really bad! #GetNoticed I want to try Dial body wash, because I have used other dial products, and they are just amazing! #GetNoticed I want to try the Dial body wash because the scent sounds like it would be very nice. I want to try the new Dial body wash and #GetNoticed! I love Dial products! #GetNoticed I love using Dial products and would love to try the body wash.
i'd like to try because i love the smell of mango! #Get Noticed I'd love to try this new scent in Dial BodyWash. It sounds like a tropical vacation! OH I love the fruity tropical scents for body wash to #GetNoticed! I be this smells amazing! #getnoticed would love to try dial on my sensitive skin! #GetNoticed I use Dial products all the time. Would love this prize! #GetNoticed Love Dial products! Bet this smells amazing! #GetNoticed I want to try this body wash because the scent sounds amazing. #Getnoticed I LOVE MANGO, basically anything Mango. My sister and I have our own mini body fragrances, sprays, soups, and lotions area within our homes! We love it! #GetNoticed. I would love to try this. I like tropical scents.